Last week, I had the chance to visit with Shane and Shiela — founders and owners of Ripsnort Food Truck. I met them at the College of Western Idaho , Boise location. It was their first time serving the students. During my visit, I witnessed how busy they were. 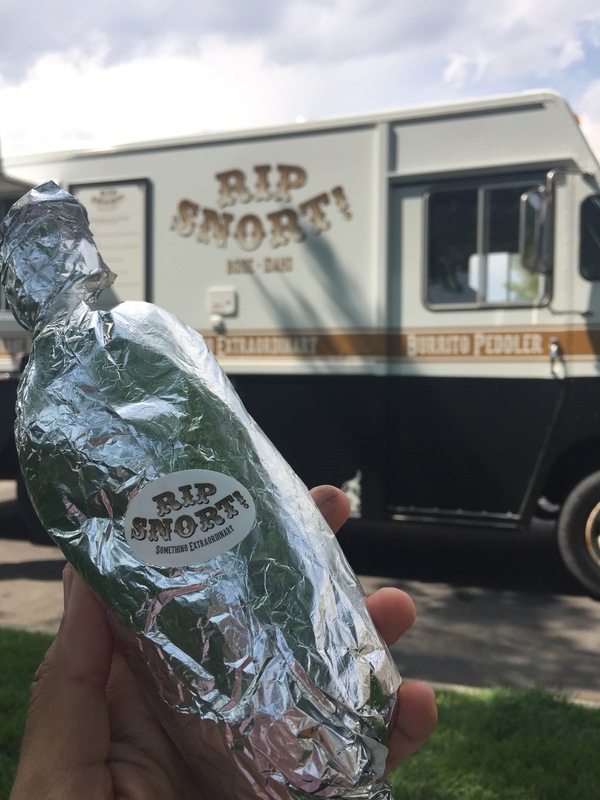 Ripsnort Food Truck beginning roots stem from when Shiela used burritos as a means to feed her family. Breakfast burritos are her jam! (hence the name of the OG burrito). Shiela then started to share the burrito with friends and family. Over the course of 10 years, Shane and Shiela were encouraged to start their own burrito food truck. On July 25th, 2017 this married couple did exactly that — started a food truck here in Boise that serves not your average burrito. Shane and Shiela are happy to return to Shane’s home state after living in Denver for some years. Like me, you’re probably wondering where Ripsnort came from. Pretty awesome story, actually. When Shane and Shiela were thinking of a name to call their food truck, they kept coming across the standard (and already used ) burrito food truck names. One day, the Merriam-Webster word of the day was ripsnorter, a term used to describe something exciting and extraordinary. Shane and Shiela also imagined that when eating their burritos, it’s a ripsnortin’ good time! Plus – their family dog snorts a lot. 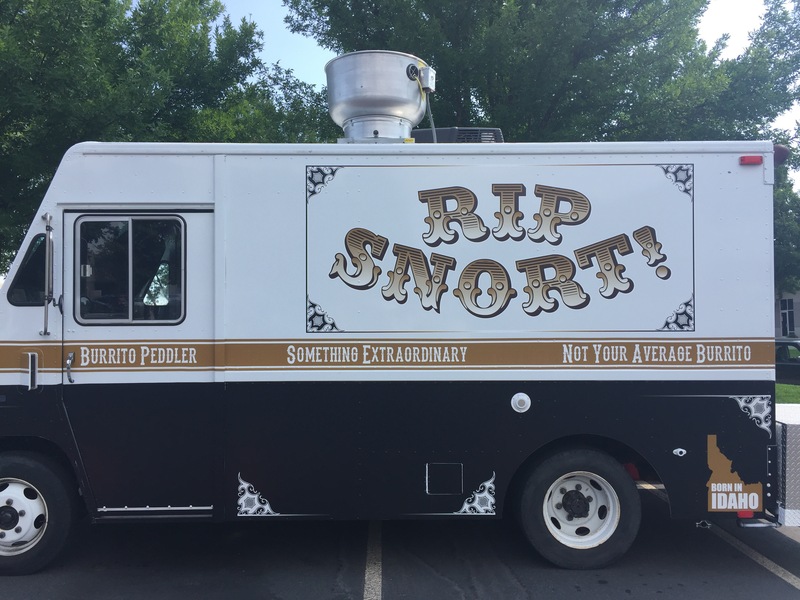 Seemed like a perfect name for their food truck. 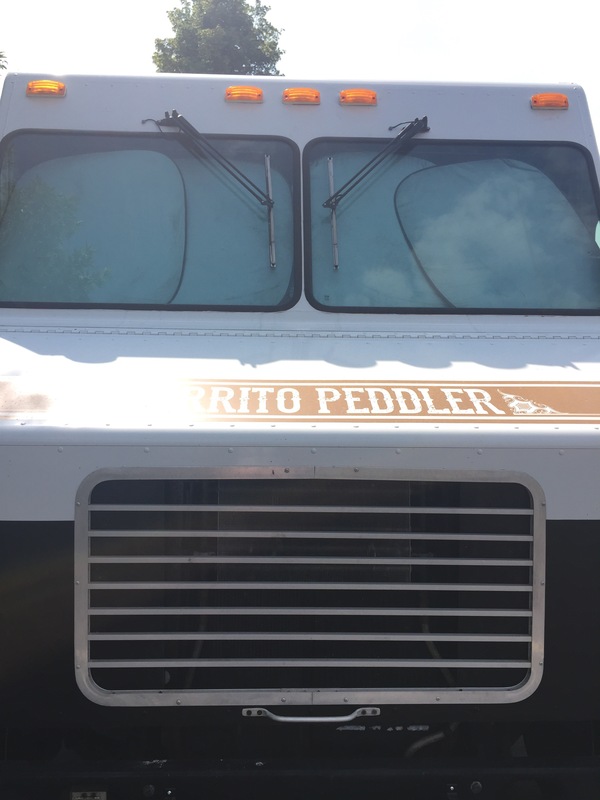 Is it a Mexican Food Truck? Shiela recognizes that her burritos are inspired by Mexican culture, especially with the use of soft flour tortillas. There were also inspired by their time in Costa Rica. The Don Jon is named after their friend, and it includes authentic Costa Rican sauce and spices. That said, the burritos represent the eclectic cultural mix of food & spices they personally love and enjoy. 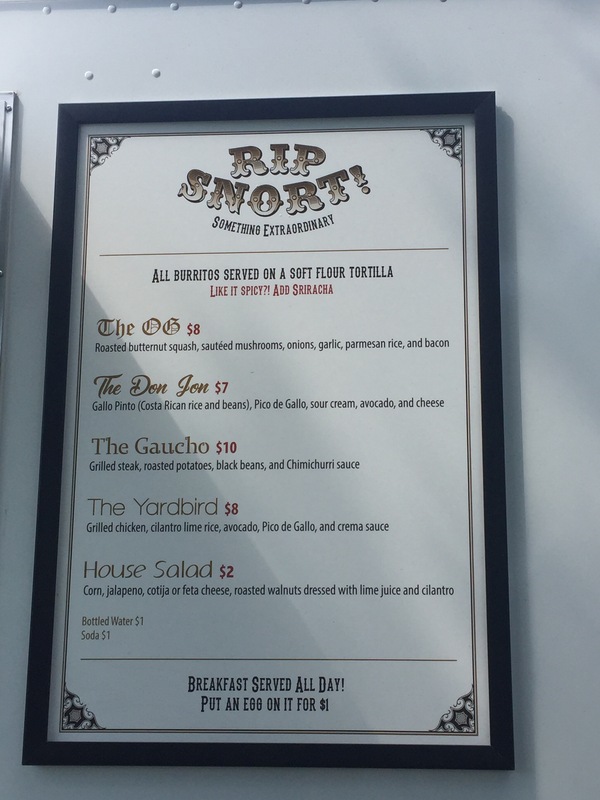 Roaming Hunger said it best when describing Rip Snort Food Truck that its food is authentically unauthentic. I couldn’t agree more. When Shiela asked me what I wanted to order, I decided to go all-in. I ordered The Gallo, added a freshly cracked egg to the mix, and topped it with Shane and Shiela’s pineapple sweet hot sauce — secret sauce that is wildly popular among their customers. It’s looking like they may even start bottling this sauce and selling it. How exciting! 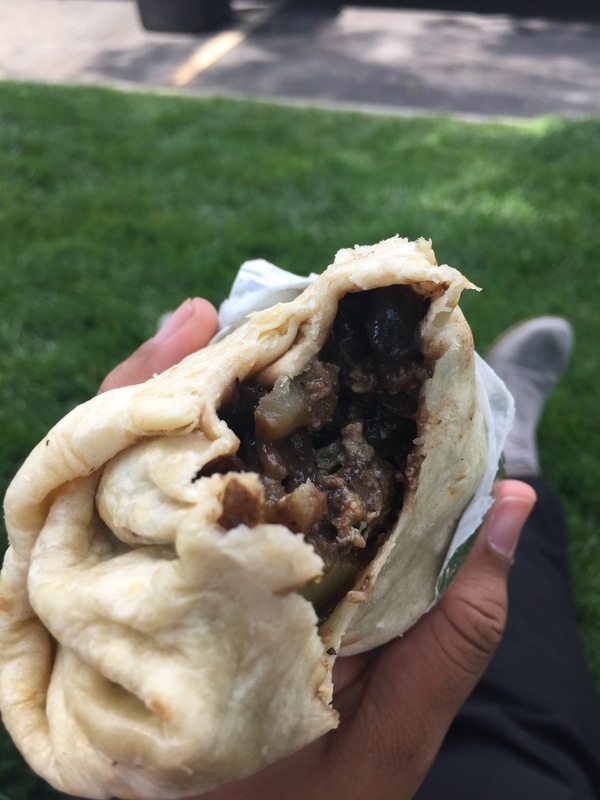 The burritos are rich with flavor filled with fresh vegetables, the tortillas are indeed soft yet strong enough to securely hold all the ingredients without spilling, and the mix of the pineapple sweet hot sauce coupled with spicy Chimichurri sauce kept my taste buds guessing. Are you a vegetarian or vegan? Ripsnort has options just for you. You can order the OG sans bacon, or the Don Jon without sour cream and cheese. It goes without saying that I am an avid fan of the food truck scene here in Boise. I’m privileged (and my belly is cursed) to have food trucks near my job every day. 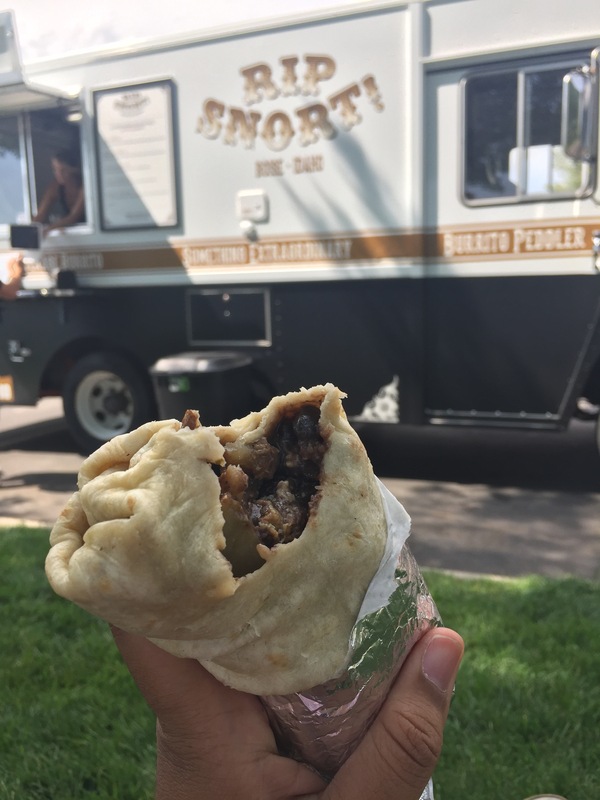 If you’re looking to try authentically made burritos comprised of new flare and tastiness, head over to Ripsnort & let yourself have a ripsnortin’ good time each time you take a bite. Fun fact: Shane restores vintage motorcycles on the side. In fact, they will be at the Petroliana Motorcycle Show from on 9/10 from 10am – 5pm. Shane may even bring one of his bikes. Big thanks to Shane and Shiela for serving me the best Gaucho around. Can’t wait to return and try the Don Jon!